The fact that author Albina Hume is a rhinoceros breeder is enough to catch most readers’ attention. But Hume’s new memoir, Miss Fortune, is about much more than rhino romance. It is a high energy story about courage, luck, determination and fate, told through the eyes of one woman on a quest for a better life. It’s also a story about how we view ourselves and of the meaning of “disability,” in that the speech impediment that caused Hume pain and hardship in childhood eventually comes to be her salvation. Through her inability to pronounce certain words, she meets the man who will eventually become her husband, and is introduced to what becomes her life’s work: preventing the extinction of the White Rhinoceros in South Africa. 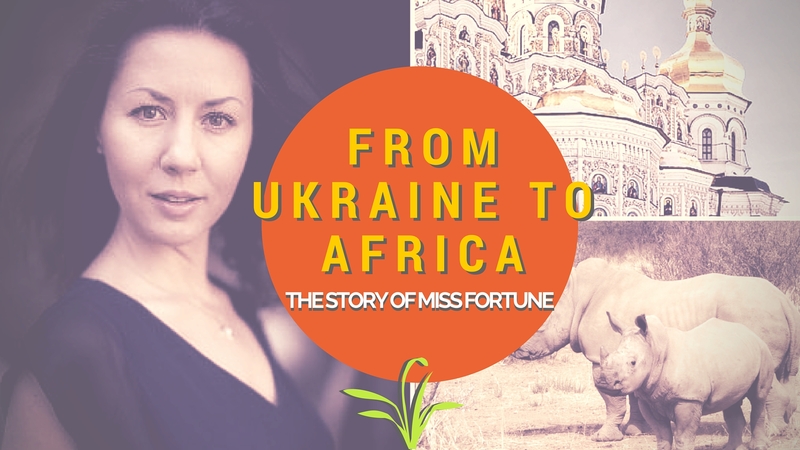 The journey from a Ukrainian childhood filled with poverty, abuse and self-doubt to a life of joy and purpose in South Africa takes the reader on an unforgettable ride through the world of Eastern European con men, sexual predators, corrupt officials and a series of ill-fated romances. Albina Hume’s life has been eventful – a mere recounting of the facts of her life would be entertaining. But it is Hume’s ability as a storyteller and her keen eye for human foibles, including her own, that makes Miss Fortune so engrossing , captivating and ultimately moving. “Who would think that my inability to pronounce the letter R would turn my life upside down and lead me from Ukraine to South Africa?”nAlbina Hume is often asked the same question – how did she meet her South African husband John, a property developer and a rhino breeder, who is 36 years her senior? She has always kept her response simple. Until now. Her childhood fear that no one in Ukraine would want to marry a ‘crow’ at first resulted in various misfortunes, from failing dreams and relationships to even ending up in a police cell for 51 days, until she finally learned to focus on her dreams, not her fears. Now, Albina and John Hume have dedicated their lives to preventing the South African rhino population from becoming extinct by breeding rhinos for future generations. In the past six years, they have bred over 500 white rhinos, with Albina emerging as a pro-rhino activist, advocating for an end to the war on trade in rhino horn that has only resulted in illegal trade and killing of rhinos and also people in Africa. Albina calls for legalising trade in horn – a renewable product – to help create harmony between African people and their natural heritage. Albina Hume was born and raised in Ukraine and now lives in South Africa, where she and her husband breed rhinoceros and have dedicated their lives to preventing the South African rhino population from becoming extinct. They are the founders of Future4Rhino, which calls for the legalization of the trade in horn – a renewable product. Future4Rhino believes that banning trade in horn creates illegal trade, which results in rhino deaths. Dr. Nina Ansary’s new book, Jewels of Allah: The Untold Story of Women in Iran tells the untold, true story of women in Iran, revealing a global sisterhood of women who, from the beginning of time, have transcended boundaries of religion, race, and culture. 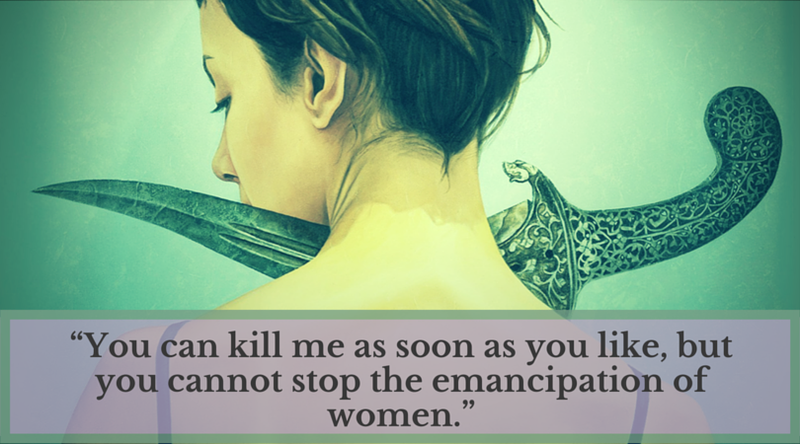 Inspired by Ansary’s own scholarly journey, Jewels of Allah is a provocative roller coaster ride that shatters stereotypical assumptions about women in Iran today as it highlights many of the courageous female leaders and advocates throughout Iran’s history. The book illuminates the unanticipated consequences of the Islamic revolution with its unexpected twists and turns that have led to a full-blown feminist movement within a post-revolutionary patriarchal society. Currently, Jewels of Allah is the number #1 Bestseller in Women in History, History Iran, and Women in Politics on Amazon and #35 of all bestselling books on Amazon. Jewels of Allah is dedicated to every individual oppressed by discriminatory ideology. 100% of all proceeds from the sale of the book will go to various charitable organizations and institutions, with the primary recipient being the OMID Foundation, a 501(c)(3) registered charity that has been empowering disadvantaged young women in Iran for over 10 years. Born in Tehran, Iran, Nina Ansary left her country of birth at the onset of the 1979 Islamic Revolution and has not returned since. Growing up in New York City, she received her B.A. in Sociology from Barnard College and her M.A. in Middle Eastern Studies fromColumbia University. In 2013, Nina received her PhD in History from Columbia University. Nina Ansary is a member of the American Association of University Women (AAUW), the National Organization for Women (NOW), and the U.S. National Committee for U.N. Women (USNC) — organizations dedicated to public policy and supporting education, charitable and gender-related causes. 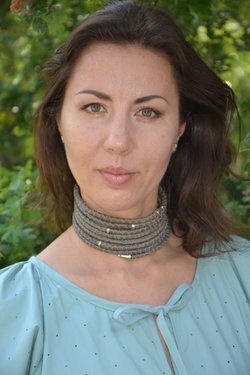 Since establishing a social media presence in March of last year, Ansary’s work has found support in a rapidly growing fan base of over 200,000 journalists, feminists, politicians, scholars, filmmakers, women and men of all ages, from diverse religions and backgrounds, who have joined her Facebook and Twitter platforms to share, discuss, and promote the accomplishments of Iranian women. She is a regular contributor to The Daily Beast, The Huffington Post and Women’s eNews, an award-winning news website which recently honored her as one of the 21 Leaders of the 21st Century. She is also one of the Top Influencers on Iran on Twitter. Described as a “cautionary tale for young people” Jamila Davis’ memoir She’s All Caught Up is also a fascinating look into the demimonde of shady deals and walking a thin line ethical line, from the point of view of the woman who became a millionaire entrepreneur at age 25. Jamila Davis is currently serving 12 and a half years in a federal prison for bank fraud. Her case involves seven real estate deals in which she and several others fabricated home buyers’ financial statements so that they would be approved for mortgages. In July of 2008, then United States Attorney Chris Christie (who is currently the governor of New Jersey and a Presidential hopeful) announced that Jamila Davis and another woman would receive “long prison terms for their roles in orchestrating a mortgage fraud scheme to defraud Lehman Brothers Bank … of more than $14 million.” Two weeks after Christie’s announcement, Lehman Brothers collapsed and nearly took the world’s economy with it. The bank that Jamila had defrauded, it turned out, had been involved in any number of shady or outright illegal schemes itself, though no Lehman Brothers executive has ever been charged with a crime. The man who prosecuted Jamila Davis, Chris Christie, has himself come under scrutiny for various scandals involving the abuse of his power as governor, missing federal funds for a railway tunnel, and the infamous “Bridgegate” case. Christie has not been charged with a crime, but the New Jersey state legislature and a federal grand jury are in the process of investigating several possible violations of law on the part of Christie and his staff. Davis’ memoir, which she wrote in prison, does not focus on the irony of her situation or the unfairness of her sentence. This is not a book about the criminal justice system or about the different meanings of “justice” for wealthy white men and women of color. Rather, it tells the story of choices, roads not taken, insecurity and fears that led a talented teenager from Queens, New York to become a real estate broker making millions of dollars from questionable deals with well-known sports and music stars. Davis tells her story with honesty and insight into how the values she was taught by her parents – hard work and excellence in school – became warped by a need for instant gratification and approval from others. She details her thoughts and feelings as a young girl through the time she wound up sentenced to federal prison with a degree of candor, depth and insight that is rare in the tell-all crime genre. Whether Ms. Davis’ crimes were the result of environment, poor choices, a natural intelligence not allowed to flower or a combination of all three is left for the reader to decide. Ms. Davis does not make excuses or blame her co-conspirators, who made plea deals in exchange for lighter sentences. She does not point out that the use of straw buyers and obtaining wildly inappropriate mortgages for financially unqualified home buyers were the norm for many banks in the 1990’s. The reader may wish she did and, indeed, there is another story in Davis’ tale: one about injustice, over-sentencing and a penal system burdened by the political expediency of a “throw away the key” mentality. But, as the author points out over and over, her fear for other young women who are easily seduced by fast money and fame was the motivation for telling her story. She’s All Caught Up tells Davis’ story admirably well. And what a story it is. Jamila T. Davis is currently incarcerated at the Danbury Federal Prison Camp For Women in Danbury, Connecticut. She is expected to be released in 2019. While in prison, Davis has become a motivational speaker and the creator of the Voices of Consequences Enrichment Series for incarcerated women. For most of us, it is hard to imagine the road that leads to active participation in white supremacist activities that include violence, and even after reading Christian Picciolini’s account of his entry into and rise to power within a skinhead organization, one is left with many questions. The book has gaps that are, perhaps, inevitable. Some things are almost inexplicable. 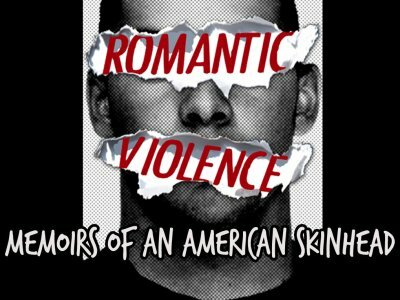 What “Romantic Violence” does provide is a fascinating window into the world of skinheads and those who believe in the supremacy of one ethnic group over another. Picciolini grew up in the suburbs of Chicago in an average middle class family that, according to the author, did not exhibit more racism than the average American family. And yet, as an early teen, he was drawn to the skinhead movement by a charismatic leader who offered him acceptance and a passionate cause to believe in. Clearly bright and a natural leader, Picciolini quickly rose to a leadership position in one of the most violent neo-Nazi groups in North America. His loneliness, sensitivity and the natural difficulties of being a teen made him ripe for targeting by the group, but it was those same traits that eventually led him to turn away from organized racism and to become a spokesperson for tolerance. The book details his inner struggles and his process of coming to grips with the fallacy of his racist beliefs, while detailing the inner workings of the group and its members. The memoir often feels almost like a thriller and at other times like an anthropological study of a secretive and dangerous American subgroup. It is rare to find a memoir this honest and raw and Picciolini is clearly still struggling with his past decisions. That struggle, ultimately, is what makes this book so worthwhile. 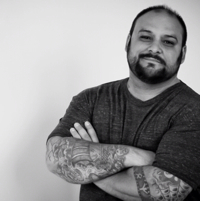 After leaving the violent hate movement he was part of during his youth, Christian Picciolini began the painstaking process of rebuilding his life. He earned a degree in International Business and International Relations from DePaul University, began his own global entertainment and media firm, and was appointed a member of the Chicago Grammy Rock Music Committee and the Chicago International Movies and Music Festival. In 2010 he co-founded Life After Hate, a nonprofit organization dedicated to helping communities and organizations gain the knowledge necessary to implement long-term solutions that counter all types of racism and violent extremism. With Ted Cruz and Rand Paul announcing their candidacies for president recently, we thought it was time to review some of the major candidates’ autobiographies. 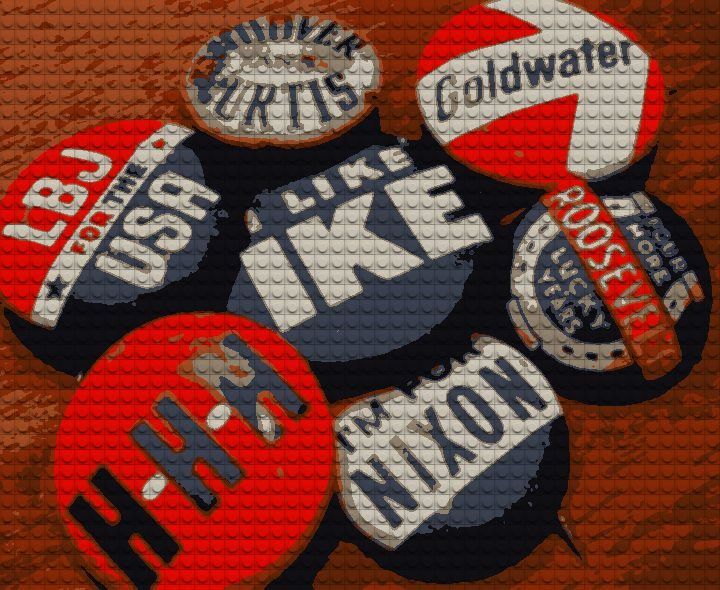 Not so long ago, it was rare for a candidate to write about him or herself but, in the last several election cycles, autobiographies by presidential hopefuls have become de rigeur. It seems that you simply cannot run for president without first penning an account of your life and philosophy that is mind-numbingly devoid of any interesting insight or fact. Other must-haves include: a red/white/blue color scheme, a heroic (but not too heroic) author photo, and a catchy title. Oh…and a ghost writer. But even the most talented ghost-writer must have something to work with to create something vaguely readable. And in the current political atmosphere, candidates are loathe to disclose anything but the most tedious and predictable stories and monotonous narrations of their political evolution. The one good thing that can be said of political autobiographies during election season it is that there are a lot of them. Which, come to think of it, isn’t a good thing at all. It seems like a bad sign when your author photo makes you look like a cross between Joe McCarthy and Droopy Dog, but there’s not much else we can say about this book, because it won’t be released until June 30th. We anticipate that it will be full of the Texas senator’s unique brand of contrarian wit and we can only hope that, like Cruz’s career thus far, it will be a wild ride through CrazyTown! We can’t rate this book, but we can suggest another one while you wait for it to come out. 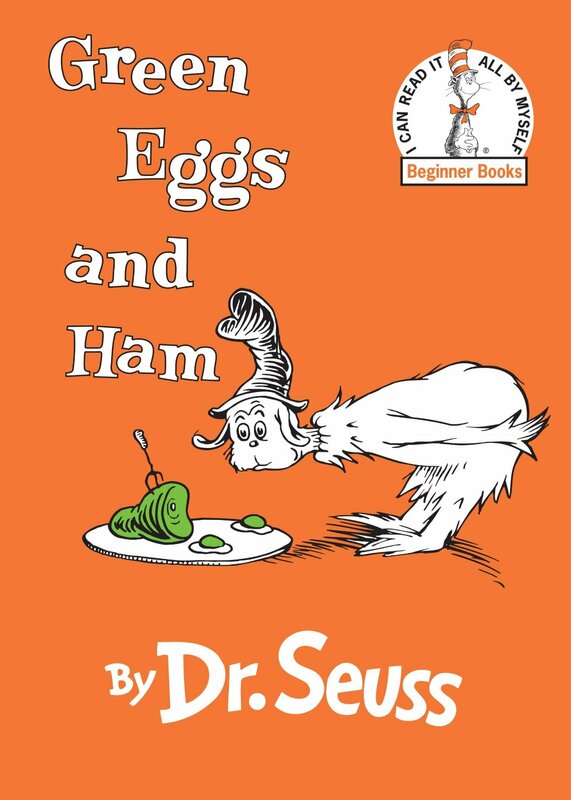 It’s one of Senator Cruz’s personal favorites and it is also a “I Can Read It All By Myself” title. Say what you will about Secretary Clinton, she is a very smart woman. And say what you will about this book, it has a lot of pages. And a lot of words on each of those pages. And each of the words is definitely English. But, somehow, when they’re all strung together, they don’t mean anything. More than a book, this is a collection of carefully crafted messages and deflections, interspersed with some stories that don’t show anyone, least of all Clinton herself, in a negative light. There’s no insight into the woman who may well be our next president, but for the sheer number of words it uses, and for the benign, inoffensive stories, and for its ability to weigh down papers on your desk, it gets a rating of: I WISH I’D NEVER LEARNED TO READ. With a title ripped from the headlines of a Cracker Barrel Restaurant menu, Huckabee’s latest down home ramblings are even more bland than those in his previous books. Indeed, if Cracker Barrel were a Chinese restaurant, one would suspect that the prose in Huckabee’s book was plagiarized from its fortune cookies. But with less mysticism. And no lucky numbers on the back. 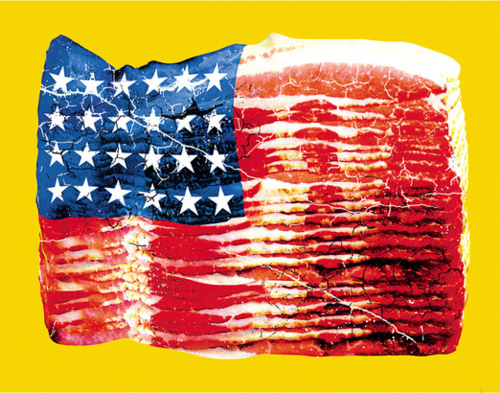 One of the major themes of the book is a lost America that Huckabee seems to feel once existed. Early on in the book, he asks, “Have I been taken to a different planet than the one on which I grew up?” Uh, we don’t know where you’ve been spending your free time. Or what that even means. But we rate this book: NOT AS BAD AS READING THE BACK OF A CEREAL BOX. Written when he was only a governor and not a presidential candidate, Scott Walker chronicles his gubernatorial challenges with a blandness that is rarely seen outside of children’s books. Highlights include the story of how he decimated unions, taking Wisconsin from a state where it was possible for blue collar workers to earn a living wage to a state with a steadily declining median income. 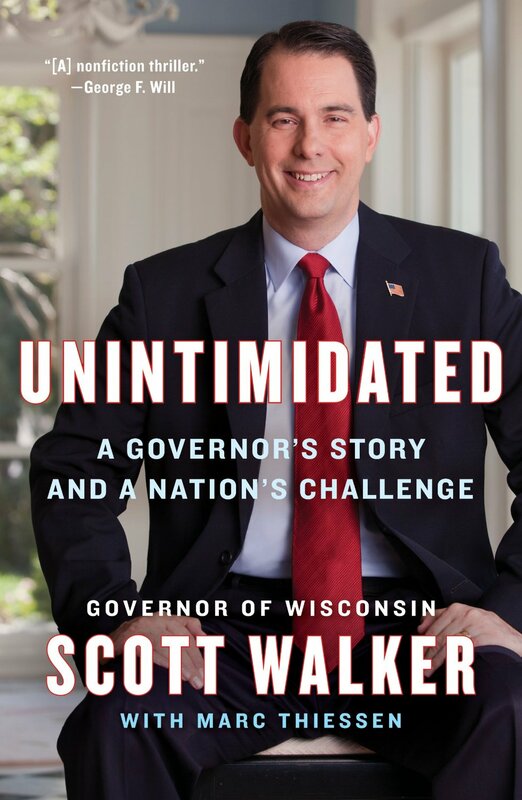 Also included, the time hundreds of thousands of people showed up at the state capital demanding he be recalled as governor, and some of his favorite sayings, like: “Change the polls, not your principles.” Walker’s autobiography is unrelenting in its platitudinous dreariness and earns a rating of: WHY IS GOD PUNISHING ME? 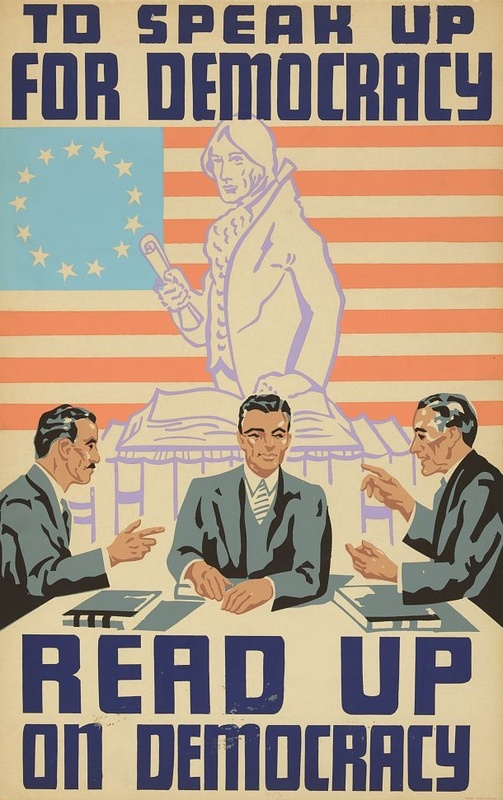 In the coming weeks, as more and more candidates come out of the woodwork and announce they are qualified to lead the most powerful country in the world, we will be back to review their books. 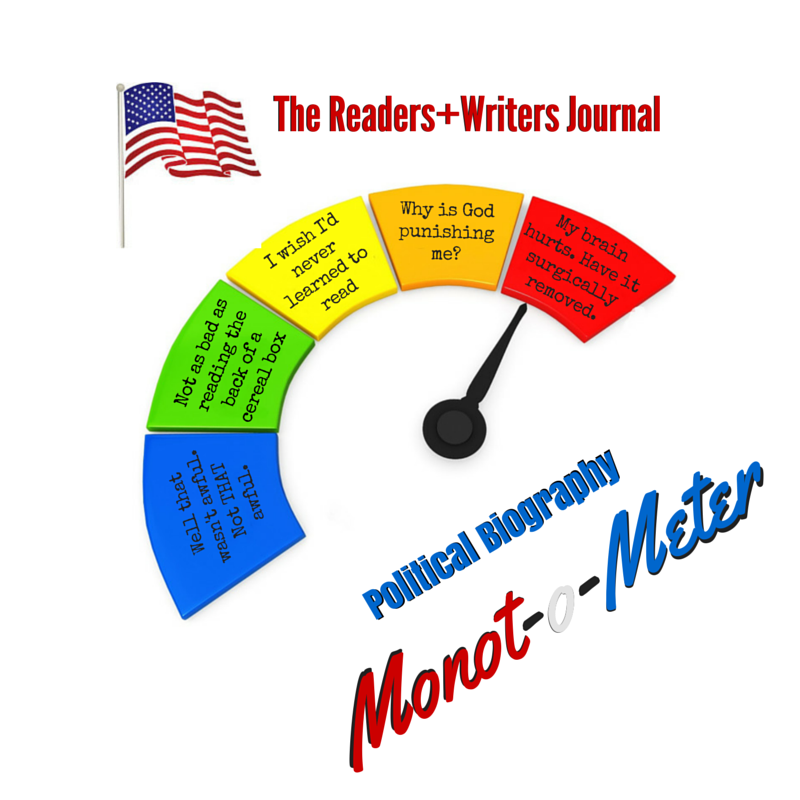 With our Monot-o-Meter™. Stay tuned. “I came out of service with my health shattered. I had no “job skills” had I been able to work… I only knew how to ‘soldier.’ There was no demand for my services. A VA doctor told me to go home and ‘shoot myself’ as a relief to my government. Perhaps I should have.” —From a letter to Congresswoman Ellen Tauscher, 2001, just months before Eddie, WWII hero, Prisoner of War, valiant soldier, passed away. This book is moving, inspiring, enraging, hopeful and depressing all at the same time. In 2014 it came to light that the Veterans Administration has been delaying treatment for hundreds of veterans and that some of the delays have resulted in veterans’ deaths. “Something From Eddie” is about a veteran of World War II but it is as relevant now as at any time. Told both as a narrative and by using his original letters, this is the story of Eddie Livingston, a hero of World War II, former prisoner of war in a Nazi prison camp, and self-described “poor white trash from Alabama.” When Eddie returned from Europe after his service he was denied benefits by the Veteran’s Administration. It was then that he set out on a 20 year campaign to get what was owed him. Along the way, he became a voice for justice and for veterans of every war. Though the diagnosis of PTSD did not yet exist when Livingston first returned to the United States after his service, he almost certainly had it. He also had permanent physical disabilities as a result of his service and confinement in the prisoner of war camp. He was unable to work and was, in many ways, a broken man. Yet he was able to find the strength to fight a decades-long battle with one of the most infuriating bureaucracies ever created: the V.A. Ironically, it may have been this battle that that gave his suffering meaning and gave him the purpose he needed to go on. Later in life, despite his personal struggles with illness and poverty, Eddie became a political activist for in other arenas, most notably the civil rights struggles of the 1960s. Ultimately, this is an inspiring story of what one man is capable of accomplishing, no matter how hurt, damaged or battered and no matter the odds stacked against him. Eddie’s service days in the United States Army include a recollection of heroism and bravery combined with pride and commitment to the American people. His capture and subsequent days as a Prisoner of War during World War II helped reshape his spirit through experiences no one should ever endure. Worse, his struggles as a Veteran, beginning in 1945 when he returned to the United States, provide a sour look at the bureaucracy that plagues US Soldiers still today. Lacking healthcare coverage, delays in payments and deficient diagnoses are only the beginning of Eddie’s 20 year struggle with Veterans Affairs and his endless correspondences with local and national politicians, including the President of the United States, to right the wrongs of the VA system. Eddie Livingston was a proud man who lived his life struggling as a result of the government’s oversight in identifying his wartime injuries, and lack of compassion to revisit his case for nearly two decades before finally admitting to his need for additional help. Throughout his days of reclusion, Eddie battled congressmen, governors and even the Vice President of the United States to accommodate the rights of all citizens, especially during the Civil Rights struggles that defined the south throughout the 1960s, while still standing up for Veterans everywhere.